Launched by professors at Princeton University and signed by experts on both sides of the Atlantic, this declaration calls for a break with the policy of unconditional support for the Likud government in Israel by US president Donald Trump, and an engagement with the region toward its denuclearization, including the signing by Israel of the Nuclear Non-Proliferation Treaty. The Middle East is in turmoil now, possibly again on the verge of a major war that could draw in the United States and Russia. President Donald Trump has pulled the United States out of the six nation nuclear agreement with Iran, known as the Joint Comprehensive Plan of Action or JCPOA. Although a few of his advisers counseled against leaving the agreement, he has brought into his cabinet advisers who are known to be hawkish toward the Middle East and prefer regime change in that area to regime reform. The most notable of these advisers is John Bolton, appointed as director of the National Security Agency. His policies align well with those of the Israeli Prime Minister, Benjamin Netanyahu, who condemned the nuclear accord with Iran from the outset. On May 14 of this year Israel celebrated the seventieth anniversary of its existence. It has enjoyed extraordinary military successes against its Arab neighbors in 1948, 1956, and 1967, and after suffering a setback at the outset of the 1973 war with Egypt and Syria, the Israel Defense Force crossed the Suez Canal and was in a position to threaten the capitals of Egypt and Syria and their many population centers. Yet, in spite of its unmatched military capabilities in the Middle East, its strong cultural institutions, its technological capacities, and its high standards of living with respect to the other states in the region, Israel has negotiated peace agreements only with Egypt and Jordan. The United States government has provided immense financial and military support to Israel as have American citizens and American corporations. The American-Israeli Political Action Committee is one of the strongest pressure groups in the United States on a par with corporate lobbies and the National Rifle Association. The recent decision of the American government to move its embassy to Jerusalem, done without extracting any concessions from the government of Israel and with no support from its European allies, makes clear the American government’s support for the state of Israel. 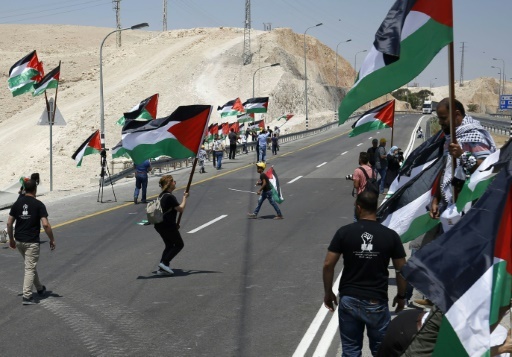 Equally important and distinctly related, perhaps as severe as the tensions between Iran and Israel, is the presence of Israel’s soldiers on the west bank of the Jordan River, with its heavy Palestinian population. The Israel Defense Force has been in military occupation of that region for five decades, making it one of the longest military occupations of modern times. The Israeli state has used its power in that area to deny statehood to the Palestinians, to oppress the Palestinian population, to dispossess Palestinians of houses and land, and has established a substantial settler population, strongly committed to annexing these territories. American political decision makers, as well as Israeli political leaders, need to rethink their political, military, economic, and cultural policies in the region. If Israel maintains its army in the West Bank and continues, with Egypt, to isolate Gaza from the outside world, surely Israel will be seen as responsible for the well-being of the Palestinian populations. It will take on apartheid-like policies. American and Korean political elites have contemplated a denuclearization of the Korean Peninsula. Would not such a policy, namely the denuclearization of the Middle East, be a worthwhile development and a major first step toward resolving the rising tensions in the area? To this day, the Israelis, possessing, according to some sources, 150 nuclear warheads and refusing to sign the non-nuclear proliferation accord or to allow the International Atomic Energy Agency to conduct inspections of its facilities, claim that Israel will never be the first to introduce nuclear weapons in the region. Although the Iranians have not claimed that their nuclear program was a response to the presence of nuclear weapons in Israel, surely that must be a factor. It is time that those of us interested in the Middle East and world peace make our voices heard. We call on others to endorse policies that favor denuclearization of the Middle East and a just and fair resolution of the Arab-Israeli dispute. This statement originated at Princeton University through conversations involving Arno J. Mayer, Stanley J. Stein, and Robert L. Tignor, all retired faculty from the history department of Princeton University. It was agreed to and signed by Abdel Aziz Ezz el-Arab (American University in Cairo), Joel Beinin (Stanford University), Noam Chomsky (MIT), Richard Falk (Princeton University and the University of California, Santa Barbara), Khaled Fahmy (University of Cambridge), James Gelvin (UCLA), Israel Gershoni (Tel Aviv University), Molly Greene (Princeton University), Alain Gresh (former editor of Le Monde Diplomatique and general editor of Orient XXI), Chris Hedges (former Middle East Bureau Chief for the New York Times); Yoram Meital (Ben Gurion University in the Negev; Ralph Nader (public citizen), Ilan Pappe (University of Exeter), Vijay Prashad (Director of the Tricontinental Institute for Social Research); Roger Owen (Harvard University), Cyrus Schayegh (University of Geneva), Taqadum al-Khatib (Free University of Berlin), Michael Wood (Princeton University) and Juan Cole (University of Michigan). Most of the signers do research and teach courses on the modern Middle East.